The genesis for this project has been the greater interest in long range forecasts in regards to the energy crisis in California. In particular, the 30-day forecasts for California for March, April and now May 2001 were for near normal temperatures while the reality was that March 2001 and May 2001 were significantly above normal and April 2001 was much below normal. This obviously begs the question of the veracity of the NCEP monthly and seasonal forecasts. The National Weather Service issues 30 and 90 day forecasts of temperature and precipitation near the middle of each month for the following month and three-month periods. Issued in graphical form the cover the 48 contiguous United States. This is a rather "quick and dirty" look at how these forecasts have performed over the past 2 years for California and is based on a comparison of forecast and observed data for each region and each month. The forecasts maps for this study were obtained from online CPC archives and the observed data for corresponding 30 and 90 day periods were generated online from the Climate Diagnostic Center (CDC) US Climate Division Maps website for the period of May 1999 through April 2001. The forecast and observed maps were analyzed for northern, central and southern California. The analysis was done for separately for temperature and precipitation based on the forecast bins in Table 1. This analysis of the forecast and observed data maps was a somewhat subjective process. Given the large areas of the regions examined, there were often more than one category of temperature or precipitation anomaly within each. The following “rules” were used to determine a representative value for each region. a) any category that covers more than 50% of the area will be representative of that area. b) If no category has greater than 50% coverage, determine the average category across the entire area. c)) In close cases, weight the category of the area toward the more populated regions. Out of the 72 30-day temperature forecasts for northern, central and southern California combined only 3 (4%) were "on category", while only 1 (1%) of the 90-day temperature forecasts has correct. None of the 30 or 90-day non-normal precipitation were on category. The matrices in Table 4 and Table 5 summarize forecast versus observed data for each of the 3 regions. Overall the 30-day temperature forecast hit the correct category 40% of the time and was off by one category 53% of the time. The 30-day rainfall forecast was considerably better, hitting 76% of the time and being off by one category 29%. The 90-day temperature forecast was on category 43% and missed by one category 44%, while the 90-day rainfall forecast was on category 75% of the time, missed by one category 6% and missed by two categories 19% of the time. In general both the 30 and 90 day temperature forecasts showed little skill, while the rainfall forecasts were considerably better. Regionally there was not much difference in the temperature between northern, central and southern California, while both the 30 and 90 day rainfall forecast for southern California were considerably better. a) The forecasts are based on the probability of occurrence, without any quantification as to how much above or below while the observed data classes were quantitatively based. b) Even a minor change of the subjectively chosen break points that are used between categories could significantly change the analysis. c) Further work should be undertaken to incorporate a BETTER “skill score” methodology. d) The sample size should be significantly increased to give a more statistically significant verification. It is my conclusion that both the 30 and 90 day forecast products from NCEP should be used with considerable caution. 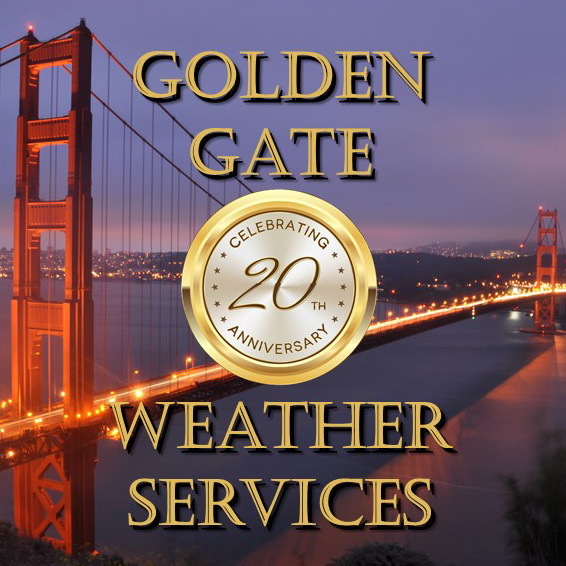 Copyright © 2000, Golden Gate Weather Services.